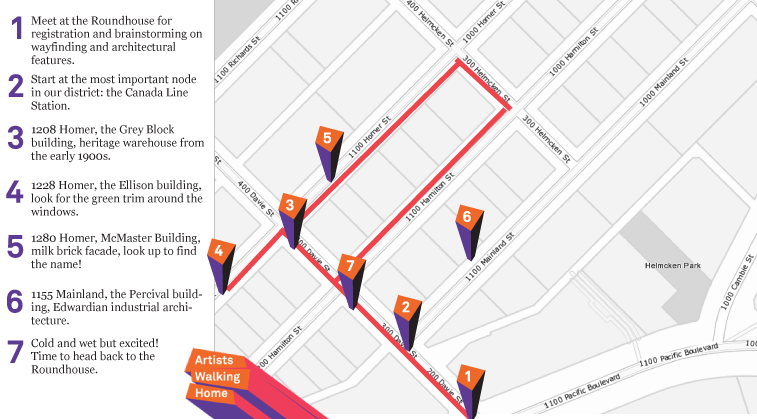 Re-Imagining Wayfinding is a community-based art project curated by Catherine Pulkinghorn, director of Artists Walking Home. The project brought together local inter-generational residents , as part of Pulkinghorn’s two year residency at the Roundhouse Community Centre, to consider the user experience of the Master Planned neighbourhood of Yaletown, in downtown Vancouver. 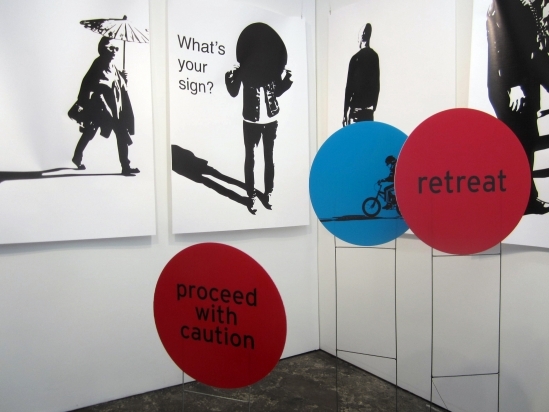 The first phase of the project consisted of community-based co-research conducted throughout 2012 to examine and interpret existing forms of wayfinding through a series of artist-led walks. The second phase extended these outcomes, empowering participants through workshops that led to the development of ideas for creating adapted, spontaneous, and community-based wayfinding signage. The 2013 youth design team worked with Catherine to develop a new set of signs for the neighbourhood, some of which were temporarily installed in David Lam Park on June 8, 2013 as part of an Urban Intervention, and are now exhibiting, with other new work, at 221A. Vancouver’s Yaletown is a new, mixed-use and residential neighbourhood, transitioned from a warehouse district after Expo 86’. Under the direction of Larry Beasley, urban planners set out to define a landscape that promoted “living first”. Through the development of the parks, boulevards and wide sidewalks framed by high rises and the seawall along False Creek in central Vancouver, the ultimate goal of inserting open space into the Master Plan was achieved. However, residents now live in apartment buildings and high-rise condominiums with security restrictions that preclude neighbour to neighbour contact, creating an atmosphere of isolation. In this densely built, downtown area, children and youth have little space for unrestricted and unsupervised wandering and exploring. At a closer look, contrary to the intent of the City’s urban planners, the experience of Yaletown could be attributed to an “organization of silence” – where the urban design both physically, through the shape of the streets, and communicatively, through the use of authoritative signage, rejects the assembly of people in physical space that traditionally constitutes a neighbourhood. The impetus for this project comes from the voices of a diversity of residents from Yaletown, who recognize that the experience of the Master Plan precludes a fixed socio-technical space, where the activities of a community are truncated through the architectural complex of towers, manicured roads and sidewalks and the signage installed to help manage the public space. 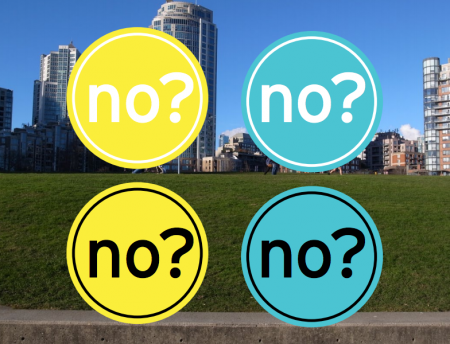 Further to this, both Pulkinghorn, an inquisitive artist and conscientious Yaletown resident, and the Roundhouse Community Centre have each identified how area youth experience there is no ‘place’ for them in the neighbourhood’s vast public space. Needless to say, the range and confusion of directives in this small area indicate a planning enthusiasm broaching the absurd for every day site users and visitors. A major conclusion of the extensive Re-Imagining Wayfinding project research is the finding that almost all project participants remarked “not noticing” neither the less significant, nor the very important or critical area signage, design features, wayfinding mechanisms and strategies integrated into the neighbourhood. Is it possible that the fairly unsophisticated, complicated and chaotic plethora of directive infrastructure, which is not streamlined, meaningful or user friendly, creates a situation wherein users block out almost all of the installations in public space, unfortunately including those from which they may benefit (the basic information they need to get around easily) or greatly enjoy (the myriad of public art and other amenities in the neighbourhood)? We think so. Please join us for the exhibition at 221A to see the reflective work Pulkinghorn and the design team are presenting. Also, keep an eye out for the dozen unique Re-Imagining Wayfindingposters installed in bus shelters around the city, as part of the City of Vancouver Public Art Program’s Transit Shelter Program. We’d love it if you send us a photo if you see one. 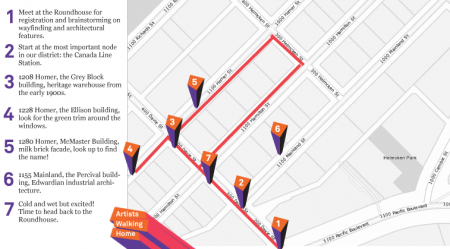 Artists Walking Home is a multi-year collaborative project that invites public participants to discourse and learn about the complex historical and social conditions of Vancouver through the embodied experiences of the city’s cultural producers.